Originally printed in "Guidelines", newsletter of San Francisco City Guides. 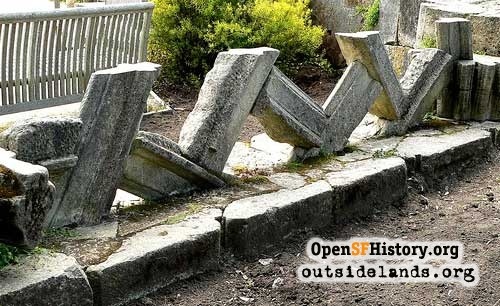 The monastery stones have been a recurrent subject of controversy ever since their arrival in San Francisco in 1941. Visitors to the San Francisco Botanical Garden see these stones conspicuously utilized for the Library Terrace Garden enclosure, the circular rock garden nearby, along the adjacent path, the Native Garden,and the Cactus and Succulent Garden. Some inkling of their history is described in the signage and during docent walks. However the complete saga of the stones should be noted and updated. Hearst still felt infinitely wealthy despite the financial crisis of 1930. San Simeon was almost finished. He envisioned still another impossibly extravagant medieval castle to replace Wyntoon, his mother's hunting lodge near Mount Shasta. It was to have eight stories with sixty-one bedrooms. Santa Maria de Ovila was fortuitously available and Hearst grabbed it eagerly. His architect, Julia Morgan, initiated a comprehensive evaluation of the site, followed by a yearlong process of demolition, packing and transportation. Among the prodigious problems afflicting this project were its remoteness, the procurement of a workforce of one hundred farmers and laborers, and the unstable nature of the Spanish political scene. The king had just abdicated, succeeded by the Second Republic. The ensuing disorganization allowed the demolition to proceed, despite its blatant illegality. Transportation required construction of a railway to the riverside, a ferry system to the other side, and a crane to lift the stones to trucks waiting on a specially built road, connecting to the main road to Madrid. Additional complications included swampy roads, drying up of the river, requiring construction of a bridge, exhaustion of excelsior supply for packing, and chronically delayed partial payments by Hearst, who was notoriously and paradoxically cash-poor. (His income was reputed to be $15,000,000 a year). Meanwhile Julia Morgan was hard at work, desparately trying to integrate the varied monastery components into the Wyntoon fantasy, which was to include a movie theater and a 150-foot long swimming pool. So the trucks rumbled along the highway to Madrid and thence to the port of Valencia. The stones were loaded onto eleven German freighters, which steamed across the ocean, through the Panama Canal, to finally dock in San Francisco.The project had consumed over $1,000,000 so far. The stones were unloaded and stored in their first San Francisco setting, the Haslett Warehouse at Fisherman's Wharf, to languish for the next ten years, at $1,000 a month rent. Financial strictures finally forced Hearst to relinquish his Wyntoon dream, which had a price tag of over $50,000,000. The monastery was now useless and the storage fees became burdensome, as bankruptcy loomed. There was no possible buyer, so in late 1940, Hearst decided to give the stones away, incidentally rejecting Franco's request for their return to Spain. Finally, his friend Herbert Fleishhacker, Chairman of the Board at the DeYoung Museum, persuaded him to sell the monastery to the city of San Francisco for a token payment of $25,000 in August 1941. It was to be re-erected in Golden Gate Park as a museum of medieval art. Julia Morgan drew plans for the new museum, infinitely more restrained than her original plans for Wyntoon. It would cost $500,000 and connect directly to the DeYoung. To move the crates to the park and to build sheds and protective covers, the city allotted $5,000. No money was available for construction, though WPA labor was anticipated. The arrival of the stones at their new location was marked almost immediately by a fire which consumed the crates, damaging their contents and markings. To repair most of the damage took a year of labor. Ensuing years were distinguished by acrimonious exchanges about contending proposals. There was fierce opposition then as now, to any new building in the park. The Federated Arts Group, chaired by Frieda Klussman, also challenged the Park location, and favored Sutro Heights, to suggest the original locus, overlooking the water, and at the same time, to echo the setting of the Cloisters in New York. The Board of Supervisors never voted for a bond issue, and the DeYoung Museum was preoccupied with the acquisition of the Brundage collection. Fleischhacker's offer to mobilize $1,000,000 worth of art for a new museum in the park was ineffective. The issue was referred to the Parks Commission, and then to a neutral citizens' commission, but was never resolved. In 1958, two more disastrous fires caused extensive damage. In 1960, though enough important stones remained to substantially rebuild the Chapter House, the major component, rapidly mounting cost estimates dashed any hope for the revival of the museum plan. .
Alternate plans were briefly considered and dropped. In the 1960s, the Recreation and Parks Department had assumed responsibility for the forlorn rock pile. Many of the stones were appropriated for various enclosure and wall projects, most prominently in the Arboretum and Japanese Tea Garden, but also in other parts of the park. One report cited the gardeners' reference to "their stones". A brief revival of interest was inspired by the Hearst Foundation in 1980-82, when it sponsored an architectural survey and a scale model . At least 50-60% of the stones remained, including most of the vaulting stones for the Chapter House.The Fine Arts Museums proposed a five year campaign to raise $45,000,000, including $3,000,000 to reconstruct the Chapter house, but there were no takers. Meantime, another scenario was gestating. In 1955, Father Thomas Davis, who was to be the Abbott of the New Clairvaux Cistercian Abbey in Vina, in the Sacramento Valley, 175 miles from the City, had detoured to San Francisco to see the stones, and to reaffirm his hopes to reclaim them. In 1982, after the last failed financing, several truckloads of stones were actually sent to the Abbey, but had to be returned because of ownership uncertainty. Father Thomas appealed agsin in 1983 and 1987; the response was 'maybe'. Then a decisive train of events was set off by the 1989 earthquake. The DeYoung was to be re-built. The Acquisition Committee assented in 1992 and the Hearst Foundation agreed. Finally, in 1994, The Board of Trustees of the Fine Arts Museums approved the "deaccessioning" of the stones and their release on indefinite loan to the Abbey. Public outcry followed, accusing the Museum of "giving away the City's ancient Spanish abbey". A supervisor called it "scandulous, arrogance towards the law", asserting that title was held by the City, not the Museum. The clamor subsided, twenty truckloads of stones eventually arrived in Vina, and the reconstruction process slowly accumulated the requisite funding. Would this finally be the happy ending to this chronicle? Not quite- still another outburst occurred in 2001, when some of the remaining stones (there were some left) were used as a decorative enclosure wall for the Library Terrace Garden. Outrage erupted, with critics referring to it as "an abomination", the"worst act of desecration of a medieval monument in the past 50 years". A UC professor was "appalled at the Park Department's handling of the stones". The construction was firmly defended, and this furor also abated. In 2006, construction is really well on its way in Vina. The Chapter House and monastery of Santa Maria de Ovila have found their last resting place, half a world away from their origins. A small part of their varied history remains in San Francisco, probably permanently. But in a larger sense, the San Francisco connection has been preserved and perhaps renewed. For the Abbey is located on a 580 acre site, formerly Leland Stanford's estate (and the largest winery in California). A winery is again in active production for the first time since 1915. The Abbey is open to the public now for 3-4 day retreats and wine tastings. Perhaps the ghosts of William Randolph Hearst and Leland Stanford, among the giants of San Francisco history, and bitter foes in life, can now be reconciled. Update, May 2011: Robert McMullin, current Development Director of the Sacred Stones project at the Abbey of New Clairvaux, notes that the Tagus River is south of Madrid, not northeast, and that the reconstruction of the Chapter House is nearing completion: "It is now 3/4 finished and with luck and revenue will be completed in 2011." Minutes from Board of Trustees Meetings, , DeYoung Museum, 1960-62 San Francisco Chronicle, August 20, 1989, "The Spanish Acquisition"
Preservation Online, March 10, 2006, "Stone by Stone"
Heritage, Vol 32, Issue 3, April 1981, "Hearst's Monastery Stones"
Read another article about the monastery stones. Page launched 29 January 2007; updated 12 May 2010.